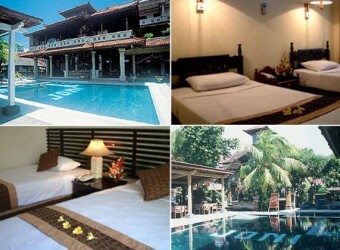 Bali Hotel It is a cheap hotel in front of Legian Beach with 78 rooms. It locates walking distance to beach and night spots. There is a big swimming pool, internet cafe, spa, etc. and JONI Restaurant holds live music and Balinese dance performance. It`s a 1 star hotel but it has great facilities!! It`s just good for my one week stay in Bali. The room is designed in Indonesian style. It was cold at night and I didn`t switch on air conditioner. I could also relax at swimming pool in the hotel!